Use of aviation fuel currently corresponds to 2-3% of the total fossil fuels used worldwide, or 13% of fossil fuel used in transportation fuel. Aviation fuel use is the second biggest sector after road transportation, which consumes 80 percent. Further, the aviation industry is expecting to grow at a faster rate than other transportation sectors. As a result of these factors, the European Emission Trading Scheme (ETS) adopted in 2005 for land based emissions will be extended to aviation emissions effective in 2012. Compliance with the ETS will require the aviation industry to blend renewables into jet fuel employed for commercial aviation. The airline industry itself is also committed to reduction of greenhouse gas emissions, and it is widely expected that renewable fuels will play a role in the industry's approach. 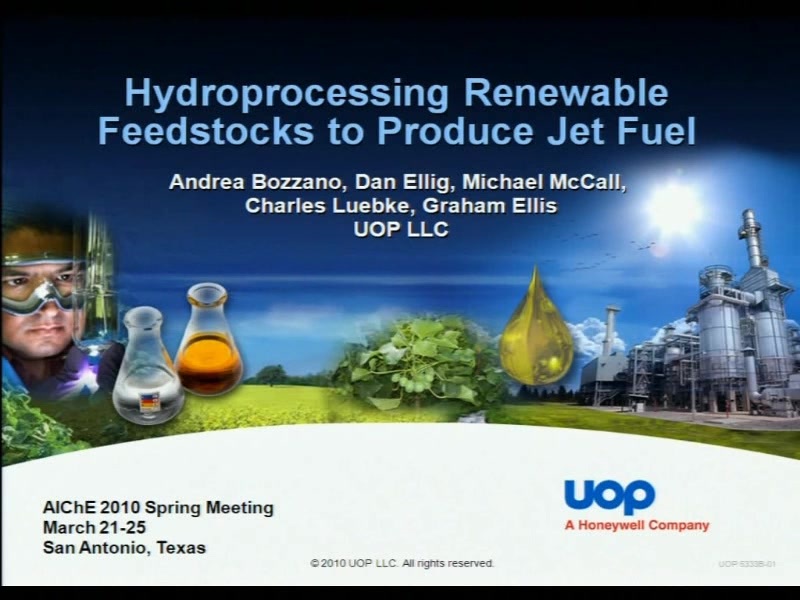 This presentation will address new technology for the conversion of sustainable natural oils, such as Camelina, Jatropha, and algal oils, to jet fuel. This project was initially funded by the Defense Advanced Research Projects Agency (DARPA), to develop a process to produce renewable Jet Propellant 8 (JP-8), which is used by U.S. and NATO militaries. The new jet fuel process produces bio-derived jet fuel (Bio-SPK), a paraffinic fuel that meets synthetic aviation fuel specifications, and therefore aligns with today's standard refinery practices. The process is designed for flexibility, having been demonstrated on a number of feedstocks, and also having the capability to produce a variable slate of renewable jet and renewable diesel fuels. The jet fuel technology was developed to convert vegetable oils and waste into a high-cetane green diesel fuel with low emissions and high efficiency. This presentation will review the experiences involved in the technology, including feedstock testing, process development, as well as certification issues. This recording is FREE to members of the Fuels and Petrochemicals Division of AIChE. AIChE members may join the Division for only $10. Join F&PD now and return to this page with your new log-in and you will receive this presentation for FREE. F&PD Members: Simply click on “click here to buy this archived webcast ” below and your ‘0’ price will appear in your shopping cart.